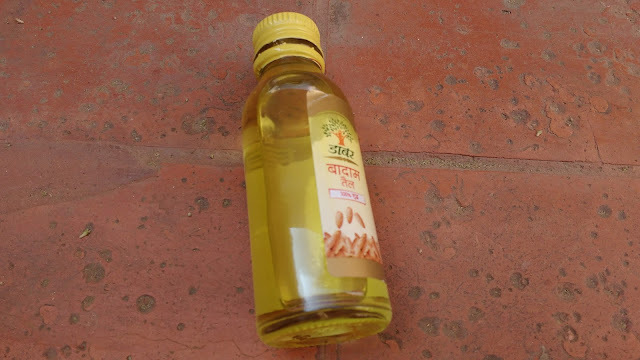 If you are a regular reader of Blingsparkle blog then you might think we are obsessed with almond oil. I particularly am becoming a very big fan of almond oil as I find it very effective both on my skin and hair. 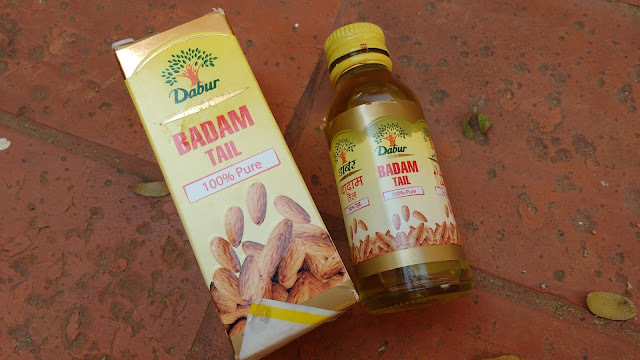 I had put almond oil into my skincare routine like 4 months back with Hamdard roghan badam shirin but after I finished this bottle I decided to experiment a bit and purchased Dabur badam Tail which I have been using on my dark circles regularly for 2 months and today I will be reviewing the same sweet almond oil and also share with you the right way to use this for dark circles. Dabur Badam Tail has packaging similar to Hamdard righan badam shirin. It comes packaged in a glass bottle with a metal yellow screw cap . The transparent glass bottle needs to be handled with care. Pure sweet almond oil is very good for health , skin and hair but I mainly use Dabur Badam Tail for my face especially under eye area to treat dark circles which i have because of over exposure to electronic screens. 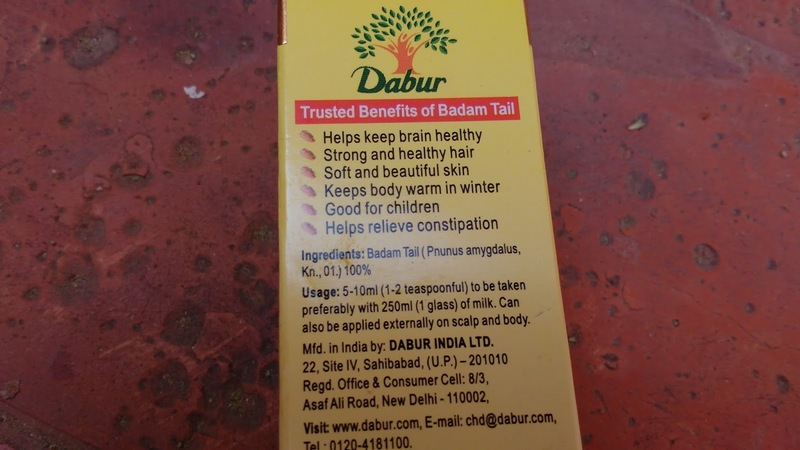 Dabur Badam Tail has a faint yellow colour and the texture is pretty thick but it spreads and gets absorbed easily into skin. I have used this oil like a moisturizer on my skin and it worked nicely. On my dry skin this oil gets absorbed completely giving a hydrating feeling and I used it both during day and night in January when winter was playing havoc with my skin. In the day I use a very little of this oil on my damp face and in night I mixed dabur badam tail with my night cream or applied the oil over my moisturized face. This worked well for me in cold weather but in February when the weather went warmer I felt my face become very oily so I stopped using it on my face and used it only for dark circles under the eye. So if you have oily skin this oil should be used lightly on face only in night . For hair I apply his almond oil from dabur lightly on the hair ends for a bit of shine like a serum and it works nicely. You can also take this oil orally like a health tonic to improve immunity and brain power as this is 100% pure. I had chronic dark circles which i did not treat at all. When doing makeup I just used concealer but recently I realized it is better to lighten dark circles than cake it up with makeup which makes it look very artificial highlighting them even more. Mostly women prefer to use chemical rich eye creams and gels under eye to treat dark circles but since the area around eye is so delicate I prefer to use natural and pure oils like almond oil. Almond oil hydrates and nourishes area around the eye and also acts like a bleaching agent reducing pigmentation. But you need to be patient as natural remedies dont work overnight. 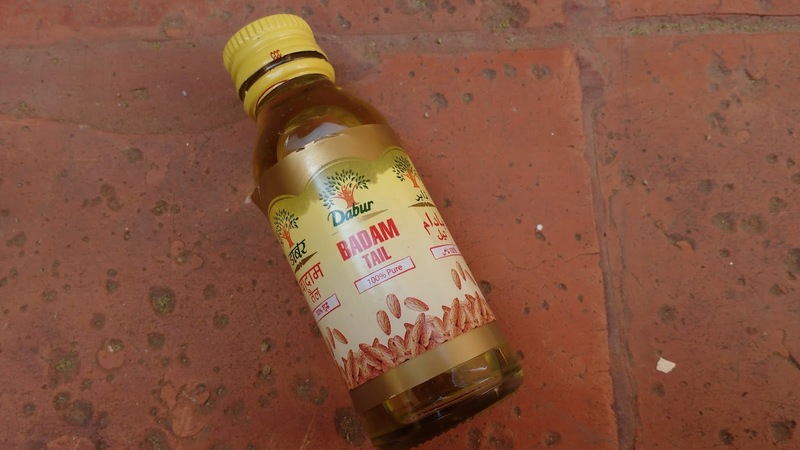 For me dabur badam tail has worked to a great extent lighten my dark circles but they havent vanished fully becuase I simply cant stay away from my laptop and mobile. And ofcourse there is a one year old I have to take care of who just doesnt sleep like a baby (aka keeps waking up all night)! Take 2-3 drops of dabur badam tail on your palm and use your ring finger to gently massage the oil around your eyes in circular motion. The area around eyes is very sensitive and you need to apply oil gently so using ring finger is recommended to put least pressure under eyes. Leave it overnight. You can put a coat of your eye cream or vaseline over almond oil if you feel your under eyes requires extra nourishment. Wash off with water early in the morning and follow this routine regularly for atleast a month to actually bid bye to dark circles. Glass packaging with a screw cap. Wish it had a flip cap. Overall I am very impressed with how Dabur Badam Tail has worked on my dark circles lightening them to a great extent. 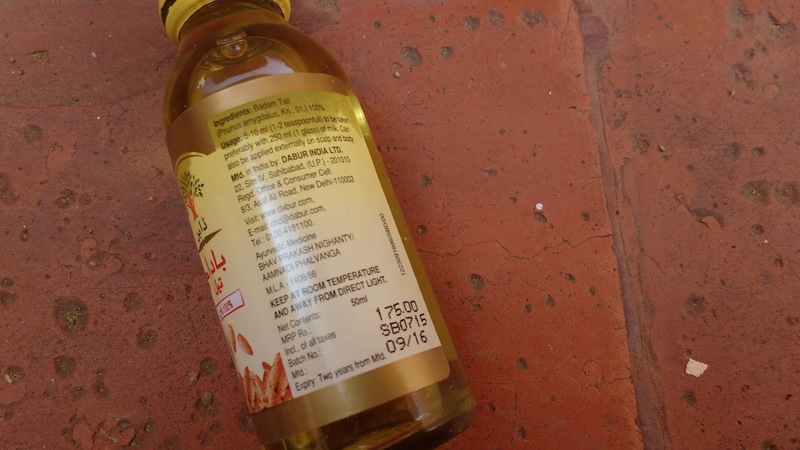 This oil is pure, affordable and can be used to treat skin, hair and health issues. If you want to try natural remedies do give this oil a try.